A characteristic that I love seeing in other people is self-honesty. However, that places a responsibility on me to be self-honest, too. Otherwise, I compromise my integrity. So, let me start with a confession: when I was young, I was culturally blind, and I struggled to see other people’s behavior from the perspective of their culture. In my mind, many types of behavior that were drilled into me as a youngster – from table manners to how to address people – were right. And anything else was wrong. Just that. Wrong. In later years, a significant life event or two caused me to start looking at people differently. At the same time, I started working with students and adult learners from a melting pot of cultures. If I had insisted on imposing my own ideas of right or wrong on them, I wouldn’t have lasted a month. Instead, I learned how to ask good questions, to listen intently, to observe behavior, and to think about what the driving force behind their behavior could be. Here’s what I learned: more often than not, there’s a link between people’s behavior and their culture and history. I also had to learn that different cultures define “respect” in different ways, especially where behavior is concerned. In my culture, it is bad manners not to make eye contact with someone. However, some ethnic groups in my country regard direct eye contact from a young person to an older person as rude. Imagine this in a conflict situation: one person shows respect by avoiding eye contact, as their culture dictates; the other person interprets the lack of eye contact as a lack of respect. There’s fuel for the fire! The most important lesson I had to learn was that I had to know my own culture very well. If you know your own culture inside out, you know why certain (unconscious) values are important to you. You also understand why you expect others to behave in a certain way in specific situations. I now lecture and facilitate group events to help others to learn about culture, diversity, values, and respect. I’ve also become very accepting of others doing things differently, and I’ve even adopted practices from other cultures. I’ve sure come a long way, but it’s been worth every step! In our Twitter poll this week, we asked which element of respect you think is most easily misunderstood. “Body language” and “degree of expressiveness” were neck-and-neck. Have a look at the poll to see all the results. • How does culture shape behavior? • How would you define “respect” based on what you learned from your culture? • How did you become of aware of some of your unconscious cultural values? • How did these unconscious values influence the way you dealt with conflict in the past? What expectations did you have of the other person/people? • When cultural differences occur at work, what effects does it have on employees? • When working with people from other cultures, which of the following would you regard as more important: to be aware of your own culture, or to learn from interacting? 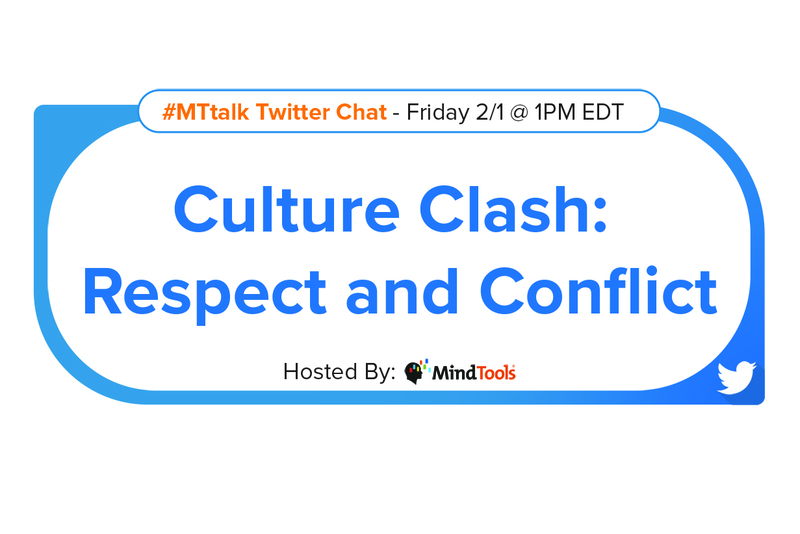 • When culture clashes occur at work, what can leaders do to resolve the situation?